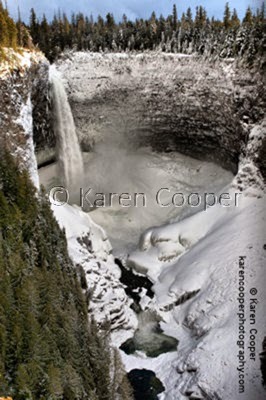 is the fourth largest waterfall in Canada. in British Columbia. Had to see it for myself. 150 ft high some winters if it's cold enough. I estimated this years dome to be roughly 100 ft high. dome is like nothing I have ever heard before. A deep muffled roar are the best words I can use to describe it. are hit the sound waves from the falls. 2 days and 2 very different skies. and adrenaline rushing all rolled into one emotion. Fear of heights is not an option. I think I am hearing another adventure about to hatch. That's definitely worthy of a 'wow!'. Amazing place. Lucky you to spend time there.